Young man drives home from work. Young woman plugs in her headphones and begins her evening run. Our narrators: two gooey-eyed lovers and fighters, fumbling their way forward in life, loss and love. Cotton Wool Kid is a story that spans years in seconds: a hospital waiting room transforms into a wedding; a kiss meets confetti as "he really swept me right off my feet! "; a crane in the sky drops a bundle of joy, cheeky and smart and growing up way too fast. One second can last a lifetime, though; our tale begins and ends with a crash. 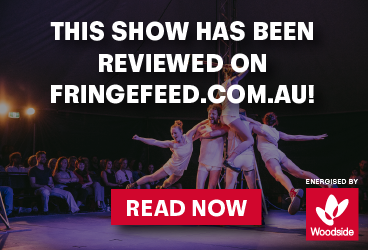 Originally developed as part of Black Swan State Theatre Company's Emerging Writers' Group, this play borrows from romantic comedies and a whole bunch of uncomfortable questions we asked Mum. A Perth-based independent production house. We create original and live theatre that entertains, provokes and challenges our contemporary audience.